Newcastle boss Alan Pardew has admitted Newcastle have had talks with Tottenham over the possibility of signing Robbie Keane. It is thought that Newcastle want to also take David Bentley on loan for the rest of the season as Spurs look to sign David Beckham later this week. Bentley would then fall down the pecking order even more and Harry thinks it’s only fair to loan him out until the end of the season. “I can’t say we have not spoken to Spurs because I spoke to them last week and we talked about players, etc, etc. It’s nothing new to the ears of most fans of Spurs and Newcastle, we knew Newcastle looked at him in the summer but Robbie thought he could prove his worth at Spurs. He now seems to have given up and accepted his future belongs elsewhere and Newcastle are a good prospect for Keane. Heurelho Gomes has spoken out again, as he has been doing quite a bit of recently, you’ve got to love him. Gomes agrees with Harry that Spurs are a couple of players short of a push for the title but said he was pleased with the new signings so far this season. Inter Milan and former Portsmouth midfielder Sulley Muntari’s time at Inter looks to be coming to an end, fueling speculation that Harry Redknapp is waiting to pounce with an offer for his former player in January. Harry had Muntari under his wings during his Portsmouth days and is a big fan of the player. La Gazzetta dello Sport claims his adventure in Milan has already been signed off after he stormed out of San Siro during Inter’s derby d’Italia against Juventus on Sunday. Clearly unhappy at his latest exclusion from the matchday squad, Muntari took his protests far, and rather than obey orders to sit in the stands, he left altogether – a sign he no longer wants to be involved with the club. Under Mourinho Muntari was a prominent figure and a vital part of the treble winning Inter team but Rafa Benitez has no plans for the midfielder. His career at Inter seems to be all but over and early indications in Italy show that Tottenham’s Harry Redknapp is waiting in the wings. Spurs now play Inter back to back in the Champions League over the coming weeks and talks could be set to begin as early as then, should a deal be reached in January then expect to see Wilson Palacios shipped out of White Hart Lane. The transfer merry go round is seemingly attached to James Milner and his on off move to Man City.Harry said.I can see that deal going through sooner rather than latter,then perhaps Aston Villa will have some money to spend. Take then from that what you will but it looks as though we could be selling some players to them,if,or rather when,Milner finally makes that move.So could that be the much talked about Robbie Keane departure,and perhaps even Jenas? Who knows,but it’s going to go down to the wire,again. He also commented on John Bostocks future after he signed a deal extension today to take him through until 2013.John has definitely got a future at Tottenham said Harry.He has gone to Hull for a season long loan,but he has to try and get into their first eleven otherwise should he fail then he’s got no chance of making it into Tottenhams. He then promised,when asked by presenter Danny Kelly to try his utmost to bring the glory nights back to Spurs. That then is great news regarding John Bostock,I’m really pleased that the lad has found a club to try and work at his game,let’s hope it will benefit him as much as it has Townsend,Mason and Rose.It’s also nice to have a manager that keeps you informed as to what’s developing at the club,well as much as he can without hindering possible transfers anyway. Your comments are as usual welcome.For healthy discussion please refrain from foul language and personal attack,thank you for your understanding. Was just listening to an interview with Harry Redknapp on Talksport and he revealed Defoe has a groin strain and I quote “it’s touch and go whether the striker is fot for the City game. Redknapp said there is no chance Defoe will feature in tomorrow’s friendly with Fiorentina tomorrow. Harry also said he would relish playing Champions League football next season should Tottenham overcome Young Boys in the Qualifying round of the Champions League. He said he would not be taking Young Boys for granted after their win over Fenerbahce in the previous round. Hopefully Defoe can be fit for the opening day, if not then I am sure Pav, Keane and Crouch can provide good cover, afterall Crouch done the business last season agaisnt the Mancs so we shouldn’t be too worried there. Hopefully it’s a Steven Gerrard thing where Harry, knowing we have City and Young Boys to play doesn’t want Defoe playing for England so is trying to play the “injury” game that Gerrard does so often. However this may persuade Harry to buy himself a new striker sooner rather than later and my money is on Bellamy arriving in the not to distant future. Peanut Butter or Djalo with my Sandro-wich? Apologies for the laboured headline. I try too hard to be clever sometimes. My parodies would prove that to you. Following the South American Copa Libertadores, Sandro [Ranieri Guimares Cordeiro] will be jetting off to lovely, sunny North London to join Spurs after SC Internacional agreed a deal with them. The two clubs are affiliated with each other so that Spurs get first pick on all Internacional Youth Academy players. Sandro is a solid defensive midfielder with purported ability to get forward and may be tipped as the other 50% of what could be one of the most formidable midfield partnerships in the League. Honduran hard-man Wilson Palacios is the other 50%. However, I have to be a Doubting-Thomas and voice my concern. Whilst I’m excited about Sandro donning the pure lilywhite strip in just a few weeks, by joining Palacios in central-midfield, a Chopper-Harris style midfield would be formed (non-Chelsea fans, Google for more info). Palacios’ cards record hasn’t presented him in the best light possible. A shining example lies in last season’s away match against Manchester United. The Honduran had a very bad day at the office. He bundled Nani over in the penalty area and was generally uneasy in defence that day. There is no point in doubling the chances of losing a player during such an important era in Spurs history [e.g. Champions’ League qualifiers]. There is now no scope for silly tackles and both Sandro and Palacios carry a risk of doing so. Additionally, I have a ‘no sh*t Sherlock’ reason for it not working out; and that is – Having two defensive midfielders is too defensive. Spurs may have one of the best defences and goalkeepers in the League on a good day, but are comparably light in attacking prowess and need the stylish playmaking of Modric to maintain a wider range of attacking options than simply wing-play from Lennon and Bale. Goalscoring ability upfront is also scarce at times. Spurs need more weight upfront (goalscoring ability, NOT Tom Huddlestone). Therefore, I’m much more excited about Yannick Djalo; the Guinean-born, Portuguese youngster who has been impressing Sporting Clube de Portugal (Sporting Lisbon to you and me) with his winger skills and his eye for goal. Djalo has shown interest in moving to England and his agent cited Tottenham as Djalo’s next destination, possibly during this transfer window, if not pretty soon. He could be Spurs’ ‘Signing of the Season’. Additional Info: The award for ‘Signing of the Season’ 2009/2010 went to Niko ‘Ginola v2.0’ Kranjcar. The cup was then named the Worthington Cup after taking over sponsorship from Coca-Cola. Below you will find our road to Wembley results, I think it was the year Ginola scored that goal agaisnt Barnsley in the FA Cup quater final. I just noticed we scored 3 goals in 5 consecutive matches. The final itself would only ever be remembered by us Spurs faithful, it was the sort of match the neutrals would have forgotten a long long time ago. Both teams were cautious but it was Tottenham who edged the match in my opinion and deserved the 1-0 win. Robbie Savage was on the pitch to wind up the Spurs players rather than play football. If you take a look back at our team, it was a mixture of good players and players I would now call pants. It brings back some great memories of Ginola I have. I was watching this one at home and when Justin Edinburgh got sent off, I like a lot of you suspected the worst, I thought we would be clinging on for dear life and Leicester would take the game to us but nothing really changed. I was braced for extra time and then Iversen went on a great run which resulted in Allan Nielsen scoring the winner deep into injury time, needless to say I creamed my pants and spilt my beer everywhere. I am too good to you lot, I spent hours making this video for you, just like the West Ham video I couldn’t find any other compilations on the net so this might be unique so feel free to nab yourself a copy and download it at will. Remember the Tottenhamv Sporting game can be seen by joining the forum where I will embed live streams for the match and future Tottenham games, so it will pay off if you join. 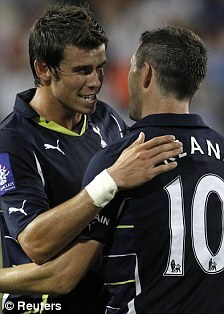 Gareth Bale has spoken of his praise for Harry and the Tottenham team for last seasons efforts. Bale said he couldn’t wait for the new season to start when Tottenham face Manchester City who will be hungry for revenge. Bale, 20, said: “That defeat against ­Portsmouth hurt so much and we were obviously down after it. “But we used it to give ourselves a kick up the backside. The manager made us realise we couldn’t let it affect us in a ­negative way. “Champions League ­football is what you have to aim for at a club like this. “But that doesn’t mean we can sit back and ­reflect on the ­achievement. “Now we must take our football to the next level and that is the task ahead for us in the new ­season. You’ve got to admire Gaeth Bale for his amazing end to last season, it’s a scary thought but if you think about it logically, it wasn’t down to Harry seeing the boy had potential it was just fate that BAE got injured so Bale got his chance, if that hadn’t happend then Bale would probably have been sold this summer, scary thought hey? From one player to the next, Roman Pavlyuchenko’s agent has claimed the 28 year old striker will be staying at Spurs, at least for now. His agent Oleg Artemov said “Tottenham chairman Daniel Levy is not going to let Roman leave, he is necessary for Harry Redknapp.With Tottenham about to make their debut in the Champions League it would seem Redknapp wants as many options up front as possible and Pavlyuchenko does not want to miss the opportunity. “Roman himself does not want to leave England but, if that does happen, he will return to a Russian club. “We have noted information appeared regarding the possible departure of the striker. Among contenders were Sporting Lisbon and Spartak Moscow. “But I did not see any movement from Spartak – there were no specifics. Again this in my view is good news, I think Pav has done enough to prove he is worth holding onto for another season, he scored a good brace agaisnt Bournemouth in a friendly and with Robbie Keane destined to leave is it really wise to sell Pav too? Nice bit of positive news this fine Sunday morning, Bale is happy, Pav might be staying, so guess what? I am happy just like Bale. Forgive me for any sloppyness here but I have stayed up to almost 4am to watch the game and then bring you a brief report, hopefully Aldo will edit the highlights into this post in when they are about. Tottenham got off to a bright start in the first 10mins of the game with Robbie Keane looking like a threat with some good runs, Bale looked hungry on and off the ball. It was half way through the 1st half though when Thierry Henry got on the end of a low cross to beat Cudicini and put NY 1 goal to the good. Have to say as much as I dislike the Gooner scum it was nice to see him using his feet instead of his hands this time. New York seemed to gain confidence from the goal and started to play with more freedom and creativity. Tottenham still looked like a threat going forward with just a few half chances before the half was up. The second half started with Spurs searching for an equalizer which arrived after 61mins from a corner which the NY defender flicked onto the far post for Robbie Keane to tap in, I said Keane had looked lively and he showed he still has natural instinct to get into positions. With the game becomming more stretched and going from end to end it was a long ball that put the NY Red Bulls defender under pressure which forced a back header to fall short for Gareth Bale to sneak in and get a toe on the end of it to beat the keeper Sutton and make it 2-1 to Spurs. All in all nothing to write home about, not a great performance but not the worst and don’t forget we still have the World Cup boys missing. Hutton done a decent job and it was nice to see Taarabt and a few of the youngsters getting a game. As I said it is half 3 in the morning so if anyone wants to add to anything I missed use the comments below. Managed to get some highlights up from the game, Cudicini made a few good saves. “We need two or three players who can make the difference,” said Redknapp. “We did great last year, but we just need to push on and maintain that,” he added. “We want to win the championship. It’s not impossible. “Fourth place last year was marvellous, but I think this is the best chance Tottenham have had in how many years to really push on and maintain that, and become a regular top four team and maybe push for a championship. I agree with Harry, our squad is there or there abouts, but I feel with 2 or 3 players of quality brought in and a few of the deadwood players shipped out that we would be a much better outfit next season. The only trouble is that time is running out, I think “Arry” put all of his eggs in one basket early on with Joe Cole, one thing he must not do is panic buy. When it comes to signings then we have the best man in the business, so we must remain positive and confident, Harry has only ever done us proud and to start doubting him not would be criminal. 2 weeks time we will find out who we play in the Champions League qualifying round, it would be nice if we could get 1 or 2 new faces in and settled for that fixture. Failure to qualify would turn us back into a laughing stock and the Gooner scum would never let us live it down. Harry must know the importance of this to our club and to the fans, I wouldn’t be surprised to see us sign someone within the next week. It’s good to see Harry is aiming high, he wants to turn us into championship contenders, and why not, now is as good time as any. You have to admire the man for thinking so highly when you consider just over a year ago his aim was to keep us in the league, how times have changed. Can we ever be anything other than supportive towards Harry after what he has done for us, up untill now I would say no. I have said in previous blogs that this is our best chance ever to really push on and compete and I am glad Harry shares m opinion. Come 14th August come rain or shine, Aldo and myself will be at the Lane supporting our team and whatever the season brings. That is what makes being a Spurs fan the best in the world. NY Red Bulls game live tomorrow night or friday morning 1 am, check the tab at the top, that’s where it will be come kick off time. Now don’t go getting excited we haven’t signed anyone yet. What I want to talk about is something different, something that is always a great feeling. What I would like to see from this summer is one “surprise signing”. When I say this I mean what I want is for Spurs to go out and sign someone and totally suprise us all, someone we haven’t been linked with time and time again in the papers. Remember when we signed Modric and Klinsmann plus i’m sure there were some others but you guys can tell me who on the comments below, but Modric and Klinsmann for example suprised most of us, we hadn’t been constantly linked to them in the papers everyday, it came out of the blue and caught us all off guard. I love that feeling. All summer long we have been linked with Joe Cole, Micah Richards,Forlan,Bellamy and a few other names, so if we go and sign any of these players it doesn’t have the same feeling of that of a surprise signing. Still a good feeling when we sign any player but not the same. It makes it all the more special if we don’t even know an awful lot about the player we sign, a real sense of anticipation and eagerness to see them put on the Spurs shirt. So hopefully Harry has something up his sleeve and didn’t put all his eggs in one basket with Joe Cole. A nice surprise signing of a player we have yet to be linked with or don’t know much about is a feeling I love. Of course I can only speak for myself but I am sure I can’t be alone on this. I don’t think we need to do too much in the transfer window but one or two tweaks to make the squad stronger wouldn’t hurt. Ship out some of the players that will be eating up the wage budget by sitting on the bench and replace them with players that are happy to be part of a squad on the verge of Champions League qualification, players that know that in this day and age to be a big team you need to be squad players.